Katrina attended the 4th Hotel Alternatives Event, organised by Hotel Analyst, at the Montcalm Marble Arch on 21st February. The event was the perfect forum to explore the opportunities and challenges being created as the boundaries between hotels and “other buildings with beds” are blurring, both for customers and investors. Hotel Analyst’s recent report showed how different accommodation segments converge with hotels for customers, for real estate or for both. Investors are increasingly on the lookout for alternatives as property yields continue to tighten. Pictured is Andrew Harrington, co-founder of AHV Associates and one of Hotel Solutions Partnership’s valued Strategic Partners. 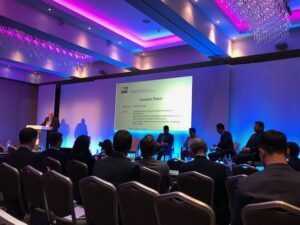 Andrew moderated a panel of Investors and Operators in the extended stay/serviced apartment sector and it was reassuring to learn that investors remain bullish in this sector as the UK prepares to leave the European Union. Katrina had the opportunity to meet a number of investors and operators at the event, and was able to promote the skills and services of the Hotel Solutions Partnership team within this emerging and interesting sector.